Well hello there! It's a beautiful Wednesday morning and here I am, sitting at our desk in the piano room. I'm wearing my pink fuzzy robe and staring at these gorgeous pictures and salivating because all I want to eat right now is this cake! But guess what. It's all gone. SURPRISE (not). Every last crumble was eaten hours ago. Boo. Oh my goodness look at the nutella squeezing out right there ^^^ YUUUUUAAMMM. This cake is impossible. It's sooooo good! You won't understand until you try it! 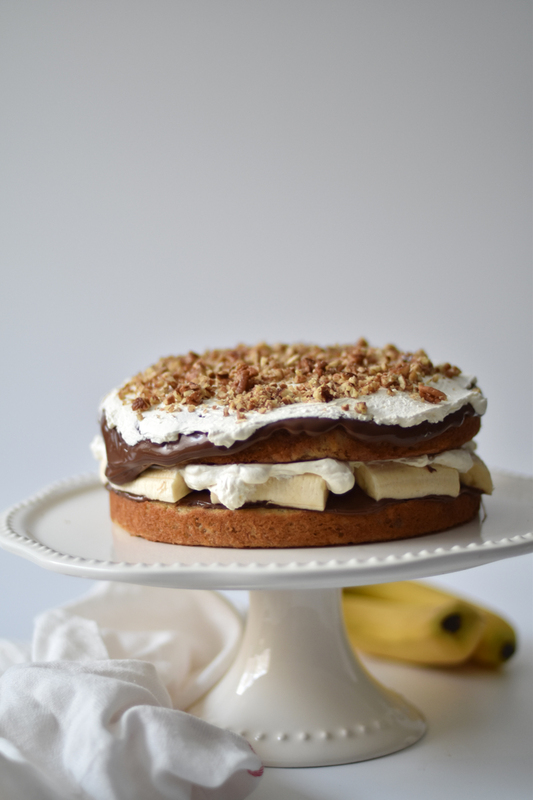 The nutella is perfectly balanced out with the whipped cream and bananas, and then the moist cake brings the flavor that connects it all and it hits your taste buds like: HALLELUJAH I'VE BEEN WAITING FOR THIS GOODNESS MY WHOLE LIFE. 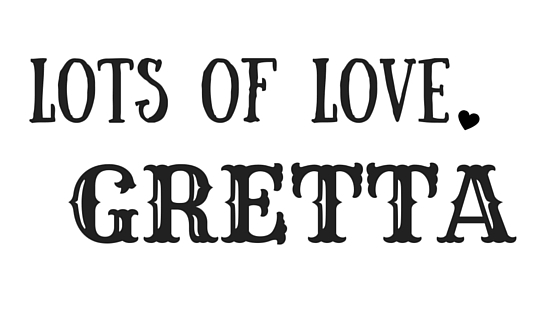 (Ok ok Gretta calm down, hah sorry). So moral of the story? 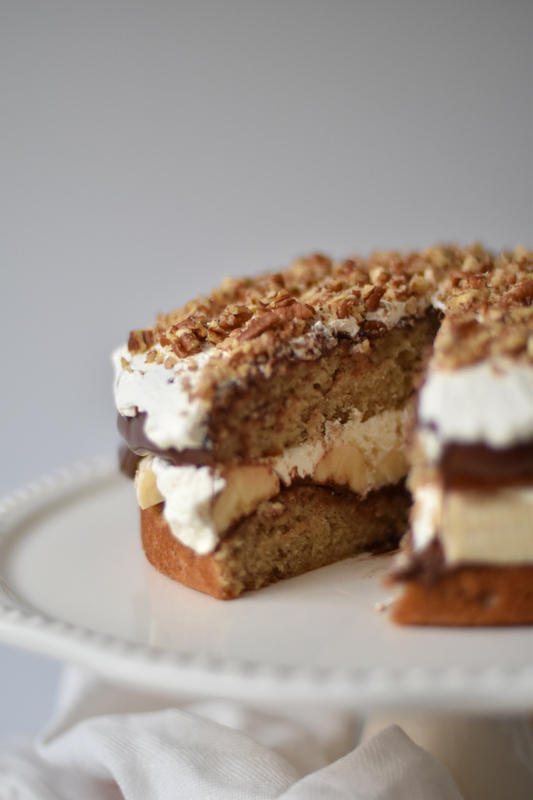 This cake is 100% pure happiness and you need it in your life. Don't believe me? Go ahead and try it yourself! 1. Preheat oven to 350 degrees Fahrenheit. Grease two 9-inch layer cake pans and line with parchment paper. 2. Cream butter and sugar together until light and fluffy. Add eggs, one at a time, beating well after each addition. Add mashed bananas, mixing thoroughly. 3. Sift dry ingredients. Alternate adding dry ingredients and buttermilk to butter and egg mixture. Stir until incorporated completely. 4. Pour batter into prepared pans. Bake for 25 to 30 minutes or until a toothpick inserted in the center comes out clean. 5. Cool in pans on a rack for 10 minutes. Remove cake from pans and let cool completely for a couple hours. 6. When cooled, place one layer on a serving plate. Spread nutella on top of cake. Be sure the nutella is warm and will spread easily, we microwaved ours for a couple seconds. ALSO, make sure all the aluminium foil is off the top of the jar! Learned that from a couple sparks in the microwave hah! >>>Side note: We really like our nutella so we use about 1 cup, but you can use less if you want. 7. 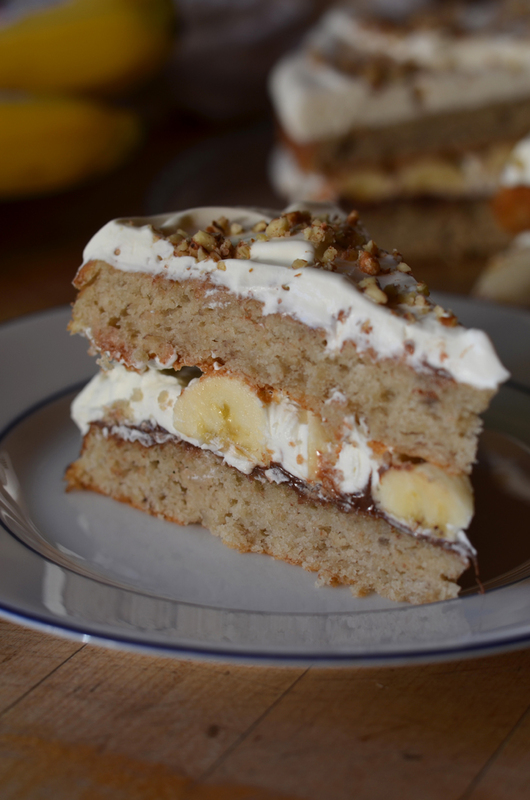 Next cut bananas lengthwise and then in half. 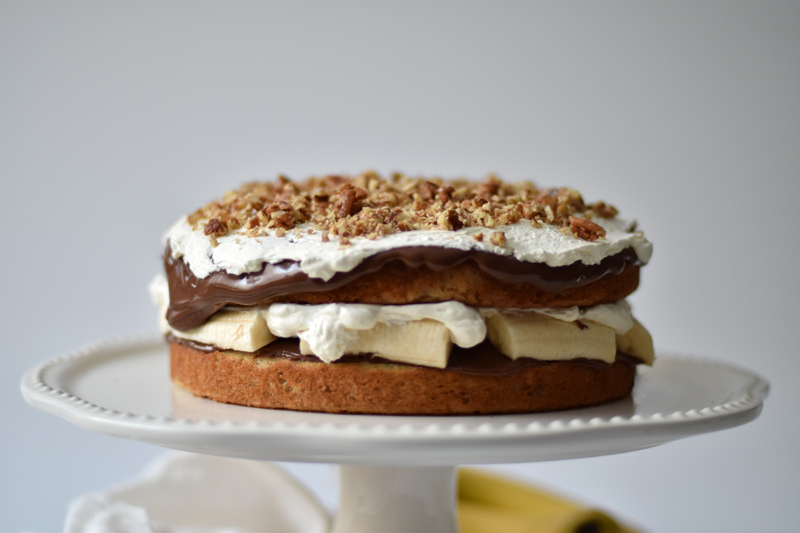 Arrange bananas on top of the cake in a circular pattern, covering as much of the cake as possible. 8. 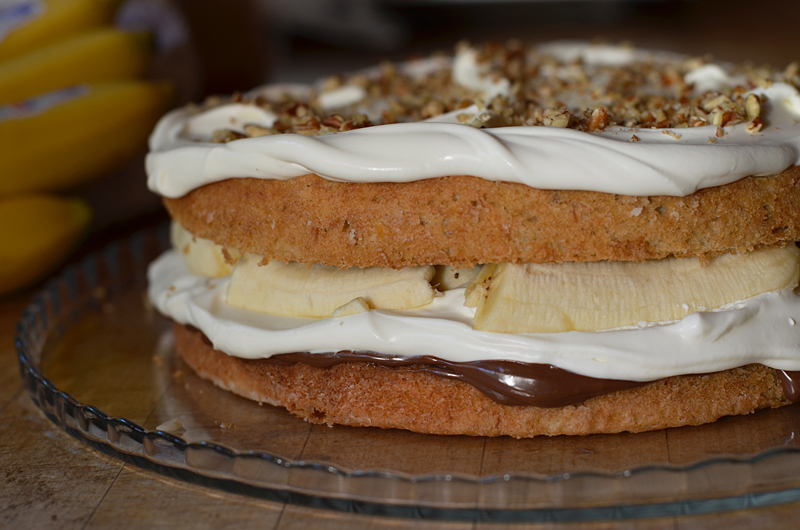 Spread a little more than half of the Whipped Cream Topping on top of the nutella and bananas layer. 9. 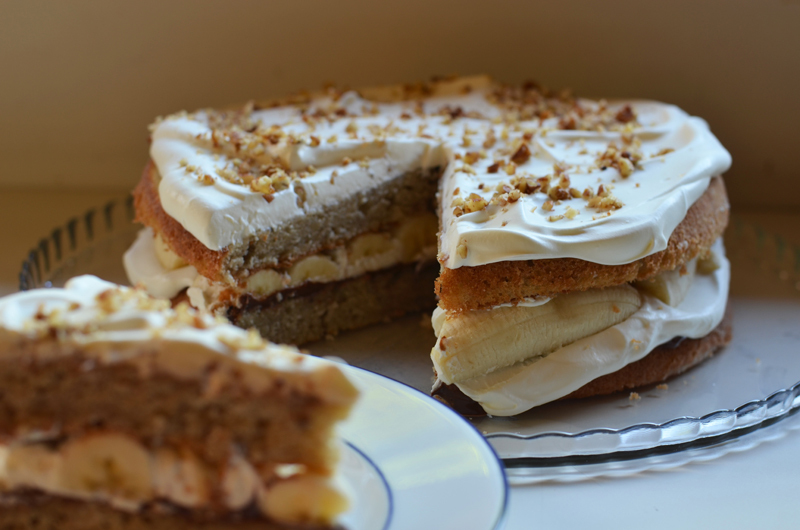 Place the second cake round on top of prepared layer and cover with the remaining Whipped Cream Topping and the chopped nuts. Pour cream, powdered sugar, and vanilla into a small mixing bowl. Using an electric mixer, beat until stiff peaks form when beaters are pulled out.